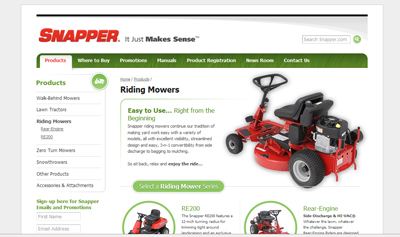 Snapper is a high-end maker of residential lawn mowers, both walk behind mowers and riding mowers and tractors. They are considered some of the best available, and are available at Snapper lawn mower retail stores, and certain models, including some riding mowers, can be purchased at Sears. What stands out the most about these great mowers is their capacity for mowing around tight corners. With optional features such as side bags for mulching or easy disposal of yard waste and debris, or expulsion of the cut grass from behind, these lawn mowers are top of the line. Coming in at an average price of between three-hundred and seven-hundred dollars, a Snapper mower from any line of their fine walk behind mowers or riding mowers will make yard work easy. Self-propelled walk behind mowers are powered by Honda engines and cost about one thousand dollars. These babies take the sweat and hard work out of mowing your lawn, with steel front and rear wheels for easy navigation, and options like bagging systems for easy cleanup. The Honda GXV160 engine that comes with many of these models will bring your mower to roaring life and is guaranteed to last a long time. Check out the great manufacturer’s warranty that comes with these as well. Financing from Snapper is a breeze with six month deferred interest plans with a monthly payment. The Hi-Vac Bagging systems that come with some walk behind models have a patented, rolled lip deck design that literally vacuums up your clippings in a flash. One of the best and most ambitious models by Snapper is the Snapper RE200 riding mower. It comes equipped with a thirteen horsepower Briggs & Stratton Intek engine, mounted at the back end of the mower. The mower weighs in at four hundred fifteen pounds, with a thirty inch cutting deck. The clippings are ejected from the right side of the mower, and the adjustable blade can cut at a thickness of 1 to 3.75 inches. It also comes equipped with a hydrostatic transmission and Snapper Ground Hugger Traction, making the handling of this mammoth mower much easier in short or tall grass. It has a twelve-inch turning radius, making it easy to get around your carefully sculpted bushes and garden plants. The gas tank has a capacity of two gallons. This mower has been given a four star rating on performance, value for your money, and features, with a three star rating on ease of use. It has a maximum forward speed of five miles per hour, so you can get through your lawn and get on with your day. The overall value, affordability, and dependability of all of Snapper’s various lines of lawn mowers, both riding mowers and push mowers, is awesome. You can’t ask for better performance than what you get with these machines. With so many models to choose from at price levels to accommodate all budgets, you can have a reliable mower at a price that is sure to satisfy. If you prefer to recycle your clippings by mulching them, there are models that can make this easy. If you prefer riding mowers over walk behind mowers, there are plenty to choose from in all price levels. The overall determining factors which will help you to decide which Snapper mower is the right one for you are the size of your lawn, your lawn’s density, the other aesthetic features of your lawn, such as sculpted bushes, shrubbery, or garden plants, how much you can afford to pay, whether you prefer sitting or standing or whether you are able bodied enough to walk for long enough periods of time to cut your lawn standing up, and how fast your grass tends to grow. If you shop at Sears or a certified Snapper mower dealer, ask an associate to walk you through the features of whatever model happens to catch your eye. Let them know exactly what you are looking for in a mower, and they will be glad to help you. Equipped with the information you need to make an informed choice, you should be able to pick out the Snapper mower that is perfect for your lawn care needs. If you operate a lawn care care company and are in the market for some new equipment, go with Snapper. Their riding mowers will help you do the job right each time. Cut down on costly equipment repairs with machines that you can count on every day. For the best quality in mowers and accessories, trust only Snapper to meet all your company’s lawn care needs. Years of superior craftsmanship and know-how have gone into these machines, and they will continue to offer you dependable service well into the future. From three-hundred to fourteen-hundred dollars, they are an incredible value, no matter what your budget. Professional landscapers use Snapper mowers to mow the lawns in front of government buildings, ball parks, Fortune 500 corporate office landscapes, and the homes of the rich and famous. Talk to your local Sears or Snapper dealer, and they will work to help you find a mower within your budget. Whatever your financial situation, you need a mower that can keep up with the summer growth of your lawn and the chore of maintaining your lawn during the fall when the leaves and debris begin to clutter up your yard. Snapper mowers make it easy to manage your property and keep it looking nice all season long. Easy to store as well, they will keep in your garden or tool shed without breaking down due to rust and cold weather. Snapper mowers are among the best available. The quality of Snapper products has gone downhill since the 2013 models were introduced. If the mower you are interested in is older than that, it is probably a good product. I would not touch any of the new designs/new models. Way, way too many dealers have dropped them for problems and customer dissatisfaction. I bought my SP Sanpper two years ago, very similar to this one, 22, self propelled, 7.25hp B&S motor, etc. two months on the job and the front wheels covers popped out during use, within a week of each other. Another month or so, the plastic cover in between the wheels fell off as well (covers the front drive belt mechanism). I tried to fix these plastic parts to no avail as the poor quality materials desintegrated. The second season started Ok, but the engine choke cable got loose and started getting caught by plants and bushes. I had to fix this one with wires and nylon tie ups. But, it didn’t stop there. During my regular mowing (2nd of the season), the rear right wheel fell off, as the plastic hub broke off from the 4 spokes (yes, just like the one you see in the picture). To my astonishment, close examination of the other whel showed that to be also cracked and ready to fall off as well. Again, the plastic and/or poor design caused the problem. I can’t run my $450 mower because two wheel fell off. Have you ever heard of that from any other brand? Exactly, me neither! I tried to find the part in their websie and I had to guess what “model” my mower was. It was a 7800831, and afer strugling with the antiquated website, I fund the darn wheel. Not only they charge $46 per wheel, as they charged $22 for shipping. The same ordinary, poor quality wheels that broke off under normal use, in less than 2 years, it would cost me $112 in parts only. In summary, do not ever buy anything from this company.